A Dublin & Glendalough training programme for prayer ministry begins this month on 26th October 2013, to be held at the Church of Ireland Theological Institute. 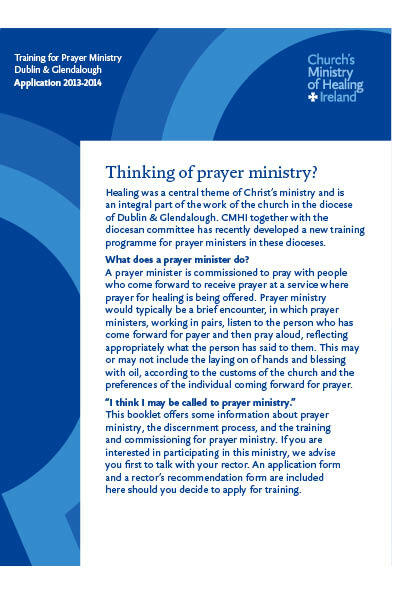 The programme is open to those within the Dublin & Glendalough dioceses who feel a calling to prayer ministry. No prior theological training is necessary; however every applicant must have their rector’s support and recommendation. Information and application forms have been mailed to all Dublin & Glendalough rectors. If you are interested in taking part, please first contact your rector. As the date is approaching quickly, we ask that applications and recommendations be submitted as quickly as possible. If you are in another diocese and would like to find out how such training can be offered where you are, please contact the central office.